I recently returned from a trip to Marbella, Spain with a few classmates and my dog, Sir Winston Pugsalot. I know how hard it can seem to find Kosher food while traveling, especially depending on the country. Luckily, my student health insurance agent is an observant Jew who’d spent some time in Spain and offered great tips on how to keep Kosher while traveling. I found a local market to avoid eating out all the time, my favorite being Supermarché Kosher. I bought basic groceries like breads and deli meats that I could prepare and cook into kosher meals without leaving the hotel, plus they sold delicious kosher wine by the bottle. Attached to Supermarché Kosher, I found that Restaurante Shalom Kosher offered a Shabbat menu, did catering, carry out and import Kosher products from France and Israel as well as locally within Spain. We enjoyed a meal of hot pastrami sandwiches with a glass of wine while listening to noise from the casino down the street. Their website (linked above) offers a menu, certification and map of their location. But, I didnt want to be a total spoil sport and never go out anywhere. The people I was traveling with were great about coming with me to try out a Kosher restaurant or two. We found a few great Kosher restaurants that were either in Marbella or super close. The two restaurants I tried were The Delis Café and the Gourmet Deli. Both offered a wide variety of food and drinks. We had dinner one evening at the Gourmet Deli after spending a few bucks at el Corte Inglés shopping center just across the street. I had a turkey sandwich, a friend of mine had a corned beef sandwich and our other friend had roast beef. Myself, my dog and friends were all satisfied, so much so that we went back the next night and shared a huge brisket platter. The Delis Café had a lot of the same food with huge portions. We enjoyed stuffed cabbage one night along with roast turkey. Marbella is a beautiful city with great weather, so nearly everything to do is outdoors, which is great if youre traveling with a pet. Touring the Old Town is absolutely necessary. It was probably my favorite part of Marbella. Its narrow streets are lined with gorgeous old buildings, shops (interesting, not kitschy), flowers and street vendors. The beaches in Marbella are to die for. 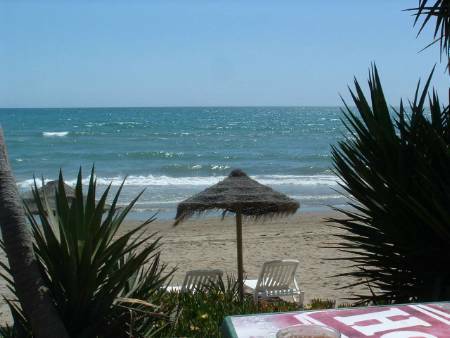 Im a beach snob, but these beaches were spectacular, especially the Paseo Maritimo beach. We also checked out the Puerto Banus area, a few of the Kosher delis were there, but I didnt absolutely fall in love with it. Its much more developed and Touristy than the Old Town and some of the beaches. There is plenty to do there, but if you dont like crowds, it might not be your scene. However, Puerto Banus does offer amazing boat and yacht cruises, which can be super affordable if youre going in with friends. Our captain was nice about letting me bring my dog, clad in his little life jacket. You can go fishing too, if thats your thing. 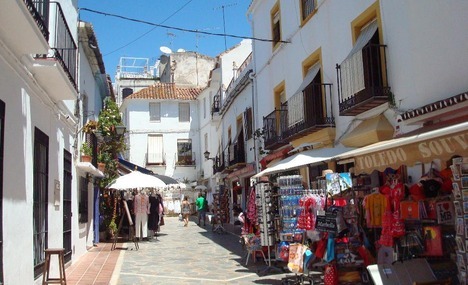 Though the Jewish community in Marbella is relatively small, there are synagogues, restaurants and markets. I attended the Beth El Synagogue a few times while I was there and felt very comfortable and welcomed. The synagogue is also a great source of information for all things Kosher while you’re in Marbella. They’d be happy to help you out. Their website offers location information as well as more resources and a useful guide for navigating the Jewish community. And most importantly, have fun and enjoy your time in Marbella! Ashley Spade is a blogger and law student who resides in Chicago. She spends her time studying, training for triathlons, and hanging out with her furry sidekick, Sir Winston Pugsalot the First, a mischievous pug. Follow their adventures on Twitter: @ashspade.